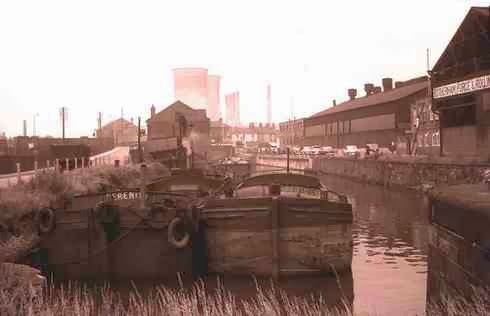 Coal loading at Bridge Street Wharf at Rotherham on the South Yorkshire Navigation. The coal was from the Old Roughwood drift mine on Fenton Road and transported by tipper lorry to the coal loading stage where it was tipped into the barge hold. The drift mine closed in the mid 60's and coaling on the wharf stopped around the same time. Serenity and another unknown vessel await their turn for loading. In the background can be seen the 'Prince of Wales' (coal fired power station) cooling towers which were demolished in 1980. The power station closed in 1978. In front is the darker outline of the bridge wharf warehouse (Later to become the 'North Notts Farmers' warehouse) In front of the warehouse can be seen the coal chute used by the tipper lorry. A lorry can be seen in position on the chute. Another is waiting its turn in the road. The Rotherham Forge buildings can be seen on the right. The Great Central railway line is on the left. Rotherham Town Lock is behind the camera position.